Seventeen Agh Darreh Gold Miners Flogged! 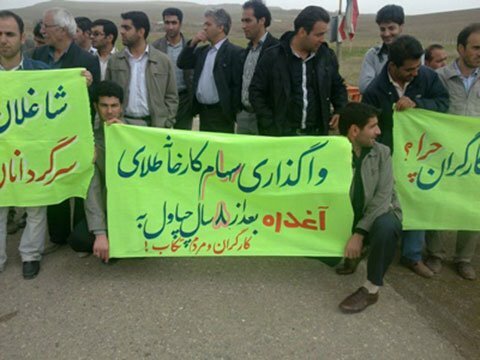 Seventeen gold miners were flogged in north-western Iran after protesting against mass sackings. In late May, 17 miners from the Agh Darreh gold mine in Western Azerbaijan province (north-western Iran) were flogged for protesting against layoffs. Iranian Labour News Agency (ILNA) reported the news on May 25th but, so far, the actual date of this heinous act by the capitalist state has not been divulged. When 350 miners were laid off in December 2014 they protested outside the mine. They wanted Pouya Zarkan, the mine’s operator, to renew their contracts. Following clashes with the mine’s security guards, the company filed a complaint against the miners. The regime’s court sentenced 17 of the miners to between 30 to 100 lashes each and fines up to half a million tomans (US$164). This is how the Iranian regime treats workers in the 21st century! Once again the Iran regime has proved that any ‘peace dividend’ that comes about from its historic nuclear deal with the imperialist powers is meant for Iran’s capitalists, regime functionaries, mollahs and their relatives. The workers have seen nothing after more than 10 months of this ‘peace’ with the imperialists, which has allowed Iran’s capitalists and their regime to escalate their class war against workers and all exploited and oppressed layers in society. The Shahrokh Zamani Action Campaign will do its utmost to publicise this barbaric and mediaeval method of punishment that has also been used against workers in 2007 and 2008. This punishment is also used against women, students and anyone who is seen as a threat to this crumbling regime.